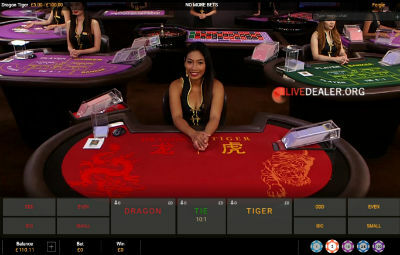 If you like your casino games simple, then Dragon Tiger might be right up your alley, because games don’t get easier to play or understand than this. 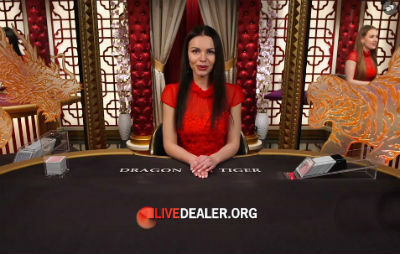 Bet Dragon, Tiger or Tie, then the dealer deals a single card to the Dragon position, and a single card to the Tiger position. Highest card wins, with King being highest, Ace lowest and suits not mattering. 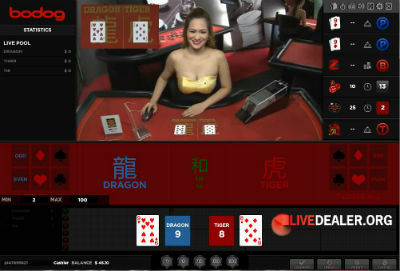 Winning Dragon or Tiger bets pay even money. The Tie payouts differ by platform…11 to 1 at Evolution Gaming, 10 to 1 at Playtech and 8 to 1 at the other listed platforms. Offering an elevated 11:1 Tie bet payout, and a Suited Tie side bet paying 50:1. Some flashy Dragon and Tiger lights in the background so you can´t miss the result. Live streamed from their Manila, Philippine studio. Dragon/Tiger pays even money, Tie bet pays 10:1. 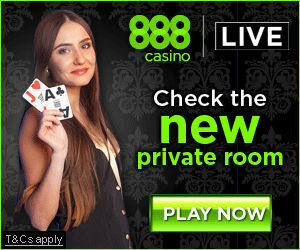 You can take some additional even money side bets on this table also. 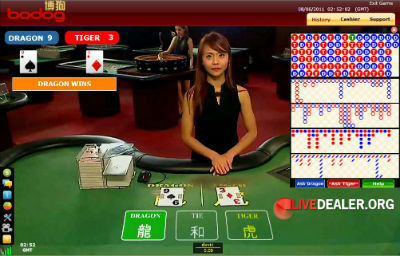 Live streamed from their studio in Manila, Philippines and dealt by the Bodog Girls. A few side bets offered here in addition to Dragon, Tiger & Tie. Also live streamed from Manila, Philippines. 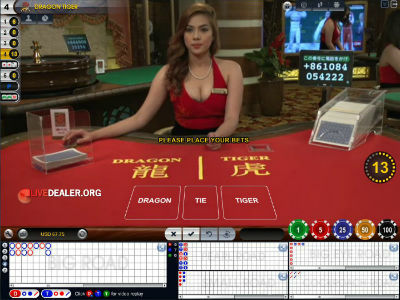 This game offers Dragon, Tiger & Tie bets only.